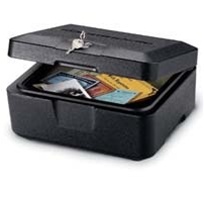 Fire-Safe Security Box Model: 0500 - Compact and versatile, Sentry®Safe Fire-Safe® Chests are the most popular in the world. A key-lock provides privacy in daily use and prevents the lid from opening in the event of a fire. For a modest, one-time investment, a family's most important papers are protected from the average house fire 24 hours-a-day, 7 days-a-week. Capacity: .2 cu. ft. 265 cu. in. Ship Weight: 11.7 lb. 5.3 kg.